The cherry blossom seems to be particularly abundant in London this year. I took this photo of a tree in bloom on a street near the Thames at Southwark Bridge. In Japan, cherry blossom symbolises the ephemeral and transient nature of life because it is so beautiful, but lasts such a short time. Cherry trees have great cultural importance in Japan. People hold flower viewing parties when the trees are in bloom and also like to picnic under the falling cherry blossom - a centuries-old tradition called "Hanami". I wish people did that in England too. 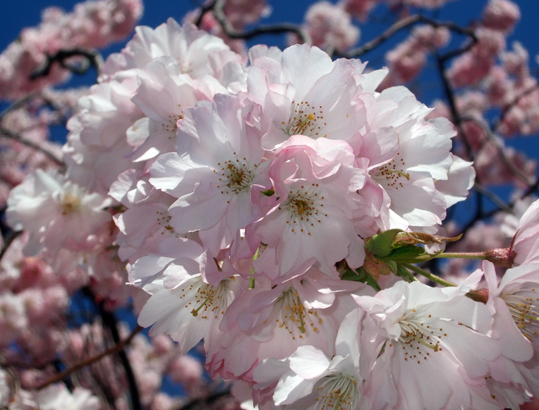 There are more than a hundreds different types of cherry tree in Japan, but we do have at least type of native cherry tree in the UK too - the wild cherry. I'm not sure quite which variety the one I photographed is, but as it has a lot of pink petals I suspect it is an ornamental type. There isn't very much folklore associated with cherry trees in the British Isles. However, in the Highlands of Scotland, seeing one is considered very auspicious.